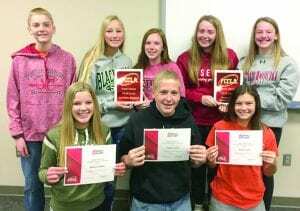 Students from the Gettysburg FCCLA organization earned Gold Top Superior awards for their projects at the state meeting in Sioux Falls from March 31 through April 2. Eight will be heading to Anaheim, CA for the National Leadership Conference June 30 through July 4. Pictured are (standing, l to r) Tanner Eide (Gerri and Shon), Makaivry Schatz (Sheila Schatz/Mark Schatz), Grace Goebel (Dave and Allison), Morgan Frost (Brad and Katie), Tyler Simon (Sally and Darrin). Front row: Makenna Miller (Bridget and Jason Nagel), Logan Decker (Kari and Rick), and Kirstie Lake (Bridget and John). The adviser for the organization is Ms. LaNae Fuerst.